It was hard figuring out what to draw for this week's challenge. Song conjured up so many images, song birds, bird song, songs from my childhood, songs that saw me through dark times. Anyway, I realised that I spent a lot of time listening to music in the backseats of cars on long journeys with my parents, so I decided to draw this. It's drawn from a photo of me as a baby in the back seat of my parents' orange Fiat. Music was a big part of my childhood, we always had music on and I remember being crooned to by Bing Crosby to Elvis, Johnny Mathis to Johnny Cash, Neil Diamond to Peter, Paul & Mary. 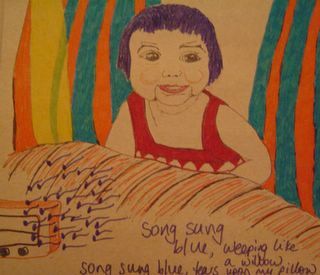 One of the first songs I learned to sing was the Neil Diamond song, Song Sung Blue, hence the blueness of this drawing. I'm not sure how I feel about this picture. It's a little freakish, but what the hell...someone might actually like it. I love the look of your artwork-this illustration is anything but freakish, it's warm and sentimental, and very much a Song. We love the work. It brought back warm and fondest memories of your childhood. It's not freakish at all. One of the most peaceful pieces of art work I've seen yet. Calm cool colors, and it has that look of tight abstract. Great job! Having grown up with you, I feel that this picture doesn't really capture "you," at least not the "you" you were then. What I do think though, is that it does capture the innocence of who you saw yourself as then now. Does that make sense? I think the reason this doesn't capture me as I was is because I gave myself (blue) hair in this picture, when in fact I was nearly bald in real life at that age!